Gotta admit, I was suspecting that they would not get along too well. But I was still hoping. Two of our chicks with Big; note her bad leg. 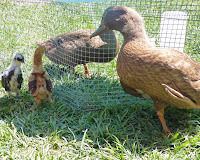 Whenever one of the little pointy-beaks came close to the round-beaks, Lotta (one of our two ducks, the one that can move) spread her wings and started hissing at and running after the little fluff-ball. Thank god we are free ranging and have a large yard, so these birds can simply avoid each other and I am expecting no losses due to establishing of a pecking order. Typically it is more the chickens that are into pecking. And with their pointy beaks they can cause quite some damage on a duck who due to her round beak basically has no ways to defend herself. But since our ducks are the big guys, hopefully the chicks will respect that and noone gets injured. I am realising I am a total duck person. 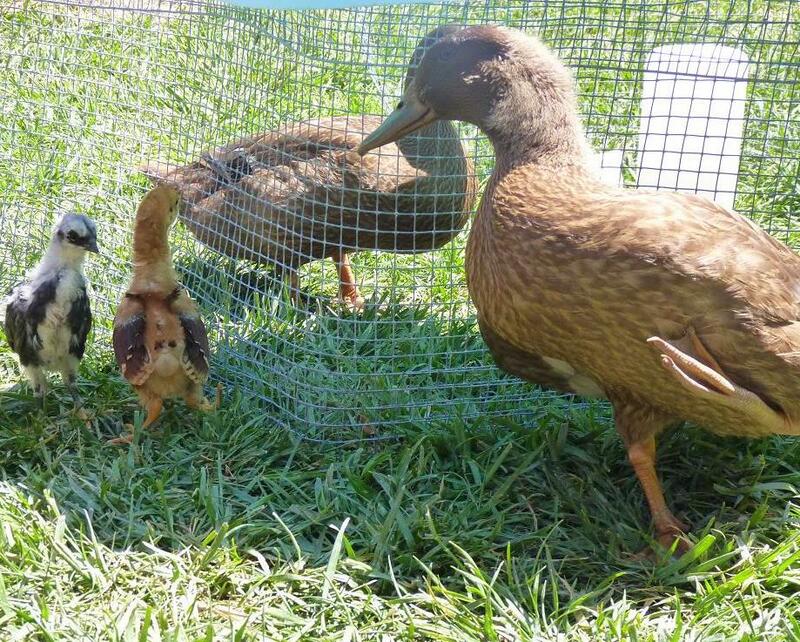 My ducks are way more docile than the chicks. They let me pick them up and pet them. Of course I think they are cuter. And I am convinced, Lotta talks to me: she yells for food, shade, water and in the evening that I bring Big in the duck house. Yes, Lotta-dear, I am coming!!! Ducks are amazingly social and caring animals. Since Big cannot walk right now, Lotta not only won't leave her side but she also protects her from everything and everyone. Whenever one of the chicks or another bird comes flying towards the food bowl, where Big typically hangs out, Lotta jumps to action. It is kinda funny to watch. Never heard a duck have a hissy fit. Stroll thru my backyard - SPRING IS HERE! Ants love my citrus trees - I don't love that!! !